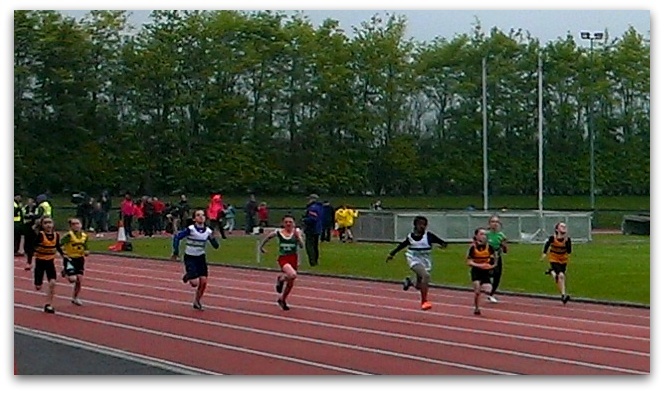 Sunday May 5th Cork Institute of Technology (CIT) hosted the first day of the 2014 Cork County Juvenile Track & Field Championships. A big event in for my niece Ella. She loves running and playing the violin though, not as yet at the same time. Hail or shine, she is eager to get out for training three times a week. No one knows if this is a lifetime commitment but her passion and dedication drives on her weary parents and it is only right and fitting to turn up at the stands to cheer her on when the occasion demands. The Counties are being hosted at the home track of Leevale, her club, so we dont have far to go, troops are galvanised and sandwiches are made straight after Mass on Sunday morning. Heats are scheduled to start at 12.30pm. It is a wet, cold and blustery day; friends, family and atheletes are clogged together on the stands for warmth, Irish sociability reigns and pronoucements, denoucements and speculations are shared over chocolate bars, cookies, lukewarm cups of tea and steaming smelly noodle pots. Down on the track a bevy of volunteers manage hurdles, sprint and middle distance runs as well as high jump, hammer throw, long jump and turbo javelin for all junior age groups. There is a plethora of activity from fast starts and false starts to photo finishes and long drawn out finishes. I find that I have a lump in my throat and tears in my eyes for the striving runners and want to cheer them all on even though I only know my niece and her little knot of musketeers – who together are close to the fastest relay team in the Country. Sprint heats are eventually called at 2pm. It takes 3 hrs to line up the final. It is 5.10pm, just minutes before I have to leave to make my flight back to London. I am down at the finish line, I dont want to miss this race and I dont want to miss my flight. This is an event fraught with anxiety and tension and although it is all over in 9.22 seconds it is no surprise that there is a splutter of parental outcry at the finish line of a false start percipitating loser’s tears, but it is a controversy without legs; the kids are cold, there was no second gun, they all ran the race and they all crossed the line. Ella is the number one finisher in her club, a mere .17 of a second behind the winner, and stoked for next week’s training session.